I absolutely love this rug! I bought this style in several sizes and I couldn't be happier with the quality! This rug is a nice thick, plush rug for being an area rug. The colors are amazing and beautiful. I love this Safavieh brand and will buy this brand again for other rooms in my home!! A marvelous exhibit of trendsetting transitional rugs, the Madison Collection instills life into extraordinary spaces. This glamorous rug has a unique nap which creates a distressed faded look to make one side of the rug lighter than the other. Its medley of faded and vibrant colors includes shades of pink, blue, orange, grey and gold. An elaborate mosaic of floral medallions adds a charming touch to contemporary, glam, bohemian, vintage, shabby chic, or transitional styles of décor. 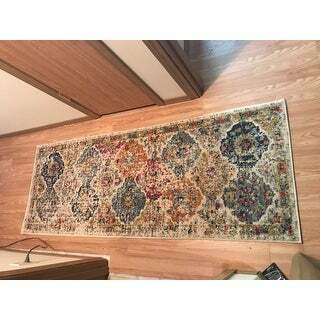 For added convenience, this stunning rug has been power-loomed in Turkey for virtually non-shedding and easy-care. First time Overstock User I took a risk ordering this rug after reading previous reviews. I was pleased when I unwrapped this rug to find the colors are brighter than the picture looks. I am using it in my kitchen as a runner with the recommended pad underneath. It is very soft to walk on and the colors work well with the greens and various shades of red and blue that I have used. I would recommend this rug. 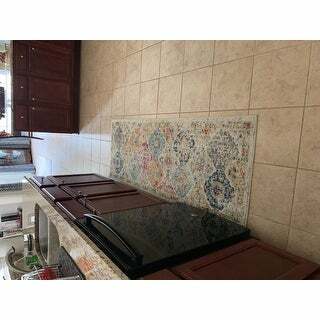 I have a deep purple kitchen wall with cream colored cabinets and dark brown granite. This pulls all those colors together --- I'm a retired interior designer! I ordered 2 of these for around my island and one 4' x 6' for the larger entry to the kitchen. The distressed colors hide dirt in this busy area. It looks great!!! and my older dog no longer slips. The same previous runner was accidentally partially melted when a too hot metal pot lid fell onto the rug! Good thing it did not burn the wooden flooring! No one was hurt! (:-)))) I will use that one in my utility room. Bohemian Meets City and likes it!! 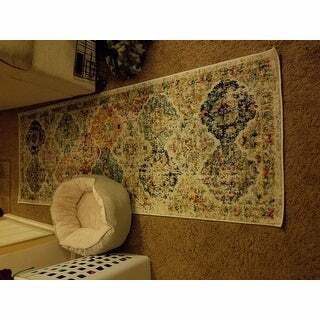 I purchased three runners and one larger sized Safavieh Madison Bohemian rugs. They are beautiful!!! I have two other very expensive rugs in the same open space of my house, and these rugs blend in beautifully. 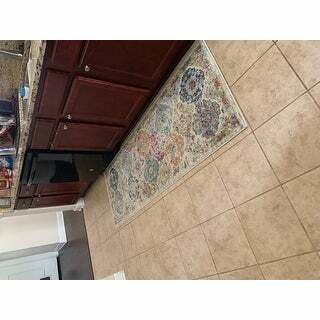 These rugs were an exceptional deal for the money, and I just love them! They arrive rolled up, but they flattened out in one day. The colors are like the photos. Very happy with this purchase!!! 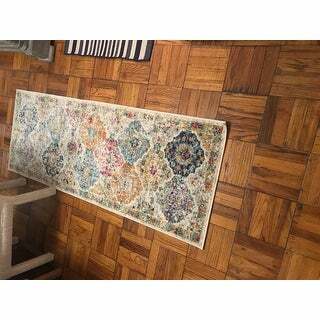 I love my new Safavieh Madison Bohemian Vintage Cream/ Multi Distressed Runner! I had to wait a while for it to be in stock, but it was worth it! I've purchased other Safavieh rugs so I knew the quality would be top notch! Thanks Overstock! I have various sizes of this Safavieh Madison Avery Boho Vintage Cream in my multifamily house -- including the runner -- and it is just so adaptable in every setting! It's visually appealing everywhere -- the colors are muted but plentiful, so it's almost impossible to go wrong with it. And it's got that faded oriental vibe that is so big right now but that I suspect will remain popular for many years to come. 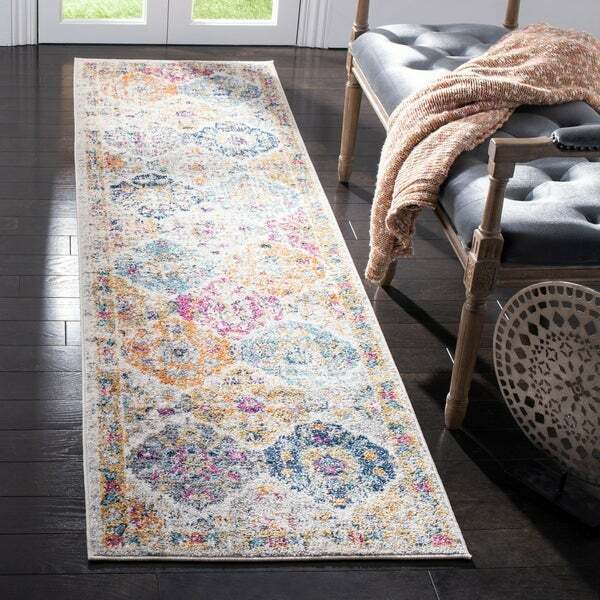 The rugs are soft underfoot ... and at the prices Overstock.com has offered me, it's a no-brainer for everyone from students to "more mature," seasoned people who love beauty and design. Don't think twice, just buy the whole set, like I did! I was looking to replace a rug in our living room with a few coordinates and create an ensemble to tie in with wood and leather and add a bit of color to help the room pop! 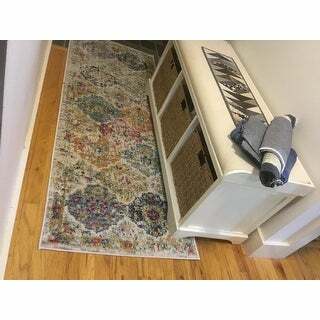 The Safavids Madison Bohemian Vintage/cream Mult distressed rug is perfect, I Purchased three sizes and plan to add a fourth in a nearby entryway. Th coordinates look amazing! 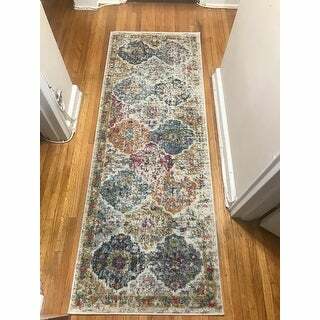 This very beautiful rug is contemporary in styling but traditional in design, in a palette of soft reds, blues and greys with other colors for accent. It is of high quality and a real enhancement to any setting. Ours is used in a bedroom; we have another which graces the entryway - both look wonderful. NICE and very soft and its not thin. This is a great addition of color to my new place. I used it right in the front door and have gotten many compliments! Was quick delivery too! Great fit and enough hues to match any color. Many complements Love it! It’s very nice. Loved the colors very much. One thing, it’s a little shorter than my previous one, but it still works. Great fit in the hallway and a great look. Beautiful hallway rug. The colors just pop, maybe due to my light floor. The rug is well made and looks it will hold up. I just wish it was a bit thicker and softer to walk on. I love this pattern very much. The colors are perfect for the space I'm decorating. Its versatile, which will allow me to change the color scheme of the room. Perfect size for under my French doors! Looks distressed as advertised. I have it at the sink in my art studio so I'm not upset if paint drops on it. It looks well used already! The runner has beautiful colors, brightens up a room. 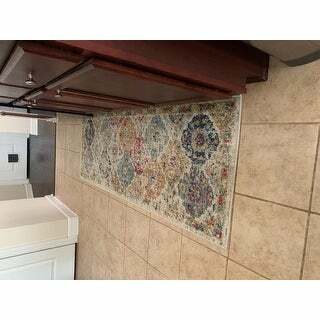 The quality seems great for the money but the back of the rug is not non-stick meaning it will move around unless you have a rug pad or something to anchor it down. I have the matching 3x5 in my entry and it did fade a little being that it's in a high traffic and dirt area. The corners also peel up a little while after time but I have had the rug for over a year. These are not meant to last forever. With those details in mind, overall I think it's a great rug for the money. Perfect colors for area that rug is in. Soft and the colors are so gorgeous. Buying another one today. The neutral colors make it easier to hide any spills. The quality is good and I've had them long enough to say they require little maintenance. The height of the pile Is very nice, too. Very cute runner! It is plush, soft and as described. Colors are vibrant. "Does this rug come in a size smaller than the 6’ length? I bought it for an entryway and the door doesn’t allow clearance. Hope I can find the same rug in a smaller size. I love it!" "Does this rug come in a 5 x 7?" "Does the rug have a non-skid back?" No but I used a Nourison Rug pad. I haven't had to wash yet but I would use a dab of dish soap, and spot clean. The way the colors melt into each other, dirt isn't showing on it. I vacuum frequently. Love it. no. says to avoid water saturation, blot spills with a damp sponge or cloth. "1. The 2 x 6 foot runner is listed as latex free while the 2 x 8 foot version is listed as containing latex. Which is accurate? 2. Is there a search function that will enable me to locate only rugs that are not backed with latex?" I got the same runner it is not latex. "Would this rug go with teal or a violet-hued purple? Is there any gray in the rug?" It does have a teal-like and puple-ish accents, as well as small flecks of light gray- so it will like coordinate well with those similar tones. I would say yes. My open area kitchen and family room is gray crouch and creme leather chair with teal and purple accents. 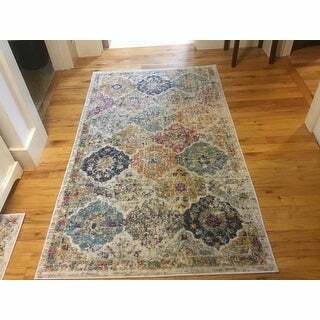 Rugs looks fantastic. The colors are muted with grayish and beige background. "Description states Cream multi What are the exact multi colors ? Difficult to determine by picture ! Thanks." I own it and if you love vintage look you will like this. Cream is the background, but very little shows. Other colors, medallion shape, in blue, burgundy, yellow, aqua, gold are scattered uneven but muted as you had had it for a long time. Absolutely lovely. I m getting others for other rooms.